Thoracolumbar (TL) fractures usually occur after high-energy trauma. Being a transitional zone between the rigid thoracic spine and the flexible lumbar spine, the TL junction is a common site for fractures. A high incidence of neurological deficits is associated with TL fractures. Kyphotic deformity, late neurological deterioration, and chronic pain are long-term consequences which can hamper the quality of life. Numerous classifications were proposed on an anatomical basis in an effort to guide the management of TL fractures and define the indications for surgery. None of these classification systems have taken into account the stabilizing effect of para-spinal muscles. The injured structures are usually capable of natural healing over time and stabilize the fracture site. These classifications have also not been validated by randomized clinical trials. There is a conflict of evidence in trials comparing conservative and surgical management in burst fractures with intact neurology. The aim of this article is to review the present literature on evidence of management of TL fractures using operative versus conservative techniques and to provide an insight into future directions. The literature review of all relevant articles published in PubMed covering “thoracolumbar fractures”, “operative”, “nonoperative treatment” was performed. The goal of TL fracture management is to restore the anatomical integrity of the spine, to aim at as best functional recovery as possible. Most of the TL fractures were treated conservatively in the past due to lack of technical expertise. Over the decades, advances in imaging and instrumentation techniques and a better understanding of the spine biomechanics have led to a shift in treatment strategy from conservative therapy to surgical intervention. However, a number of studies in literature showed good functional outcome in patients treated conservatively for TL fractures. From the viewpoint of evidence-based medicine, there is a lack of high-quality evidence on the comparative outcomes of conservative versus operative treatment. Two main principles guide the management of TL fractures: biomechanical stability and neurological optimization. An unstable TL fracture has a risk of neurological deterioration on early mobilization. Compression fractures are managed conservatively whereas the majority of the unstable injuries such as fracture-dislocations/flexion distraction injuries are managed surgically. There is a need for high-level studies comparing conservative and surgical management in neurologically compromised patients since a majority of these cases get operated. Controversy exists in the literature regarding the management of TL burst fracture with no neurologic compromise. Numerous classification systems have come up to guide the management of TL fractures. Whereas Denis classification stressed on the integrity of the middle column, McAfee et al. used computed tomography scan findings for classification. Aebi proposed a comprehensive AO classification that combined pathomorphological findings (based on imaging) and mechanics of the injury with emphasis on the posterior ligament complex. The load sharing classification of McCormack et al. proposed a score to determine the approach to surgery. The Thoracolumbar Injury Classification and Severity Score was proposed by Lee et al. to facilitate the clinical decision-making. None of these classifications were able to establish the ideal management options through randomized studies. Controversies also exist regarding the criteria for instability in a TL burst fracture. Holdsworth was the first to describe the importance of posterior ligamentous complex and defined instability as the rupture of the posterior ligamentous complex. Denis stated that all burst fractures are unstable even when they present without neurodeficits. McAfee pointed out that progressive neurologic deficit, associated posterior element disruption, kyphosis progressing 20° or more in the presence of a neural deficit, >50% loss of vertebral height with facet joint subluxation and CT-demonstrated free bony fragments within a compromised spinal canal associated with an incomplete neural deficit as the indicators of instability. A table of various theories defining the criteria of instability is shown in [Table 1]. Whether the burst fracture, especially in the cases without neurologic deficits, is really unstable has remained unsolved and subjective. Some authors believe that all burst fractures without neurologic deficits are “stable.” Magerl described the treatment modalities should not be based on the presence/absence of instability but on the type and degree of instability. Can the Same Be Achieved Nonsurgically? Surgeons in favor of surgical management have few arguments. The first is that immediate stabilization of the spine will decrease the chance of neurologic deterioration. Second is that surgery will correct kyphosis, thereby decreasing pain and perhaps future degenerative change. Third is that surgery allows early mobilization, thereby decreasing the complications and costs related to prolonged bed rest. Fourth is that surgical decompression allows the removal of retropulsed fragments from the canal and decreases the chances of neurological deterioration. The study by Denis stands out as the only study in the literature reporting a neurological deterioration with conservative treatment of burst fractures. He reported a neurological deterioration in 6 out of 29 patients with burst fractures. His results were not supported in the subsequent literature. Shen et al. in 2001 believed that since surgeons are reluctant to publish iatrogenic injuries, reports of neurological deterioration after surgery are few. However, he speculated that the risk of neurologic injury actually may be higher with surgical management based on his experience. Weinstein et al. had successfully treated 42 patients conservatively and no case with early or late neurological deterioration was reported. Chow et al. also reported successful conservative management in 26 patients with hyperextension bracing or casting with no neurological deterioration. Cantor et al., Shen and Shen., Wood et al., and Celebi et al. had similar findings. [Table 2] describes the results in literature on various conservatively managed TL fractures. The amount of correction obtained after surgical intervention is impressive initially, but studies showed that much of it would be lost subsequently. The kyphosis increases even when the hardware remains intact through mechanisms such as motion at screw-plate junction, motion of screw within the bone and fatigue bending. Extension of the fusion may preserve the correction but at the cost of loss of motion segments. An increase in kyphosis up to 12° was reported following posterior surgery. McNamara et al. reported a postoperative kyphosis progression of 8.7° with only 69% return to routine activity in his 13 surgical patients. No significant difference in kyphotic progression was noted between conservative and surgical groups in the randomized study by Wood et al. Kyphosis did not correlate well with clinical results, irrespective of the type of management. In a long-term follow-up (average of 20.2 years) of Weinstein et al. the degree of kyphosis did not correlate with pain or function at follow-up. In the study by Shen and Shen, the clinical correlation with kyphosis also was found to be poor, even when the kyphosis was >30°. The concept that kyphosis may cause early degeneration is also assumptive. Evaluating pseudoarthrosis with the implant in situ is also difficult. They mentioned that unrecognized pseudarthrosis may account for some loss of correction and impact on the outcome. Shen and Shen did not find any complications related to early mobilization. They believed that early mobilization reduces the complications of prolonged bed rest. In the literature, the mobilization protocols for nonoperative treatment vary from 6 weeks in a roto-rest bed to early mobilization in a brace. Such wide variation in the recommended period of recumbency suggests that it is not a critical factor. The role of bracing is likewise debatable. Lumbar orthoses function by restricting gross movements of the spine and not micro movements in the intervertebral region. They believed that bracing is useful for initial pain control; however, it does not prevent the collapse of the vertebrae and probably does not change the long-term result. Burst fractures are usually associated with retropulsion of bony fragments into the canal and associated canal compromise. Canal compromise >25% is often quoted as an indication for surgery in fear of neurological deterioration. It is already established that the neurological injury primarily occurs at the time of injury due to the mechanical damage to the cord. There are studies which proved that the geometry of canal is not an indicator of the extent of neurological dysfunction and that surgical decompression does not alter its outcome. In fact, the neurological status itself is an indicator that the canal is not compromised enough to cause neurological compromise. Therefore, the need for surgical decompression of the canal is not present. The fear of progression of canal stenosis and causing neurological compromise is also not established. In fact, studies have shown that the vice versa is true as the retropulsed fragments gradually resorb with the remodeling of the canal. Shen and Shen noted a resorption of approximately half of the retropulsed fragment within a year. Interestingly, Celebi et al. found that the remodeling is better with a higher amount of initial canal compromise. Yazici et al. and Dai found no significant difference in the amount of canal remodeling between conservatively and surgically managed patients. Mohanty and Venkatram demonstrated in their study on TL burst fractures treated conservatively that there was no correlation between the initial neurological deficit and subsequent recovery with the degree of canal compromise. Four prospective trials comparing operative and nonoperative management were available in the literature. 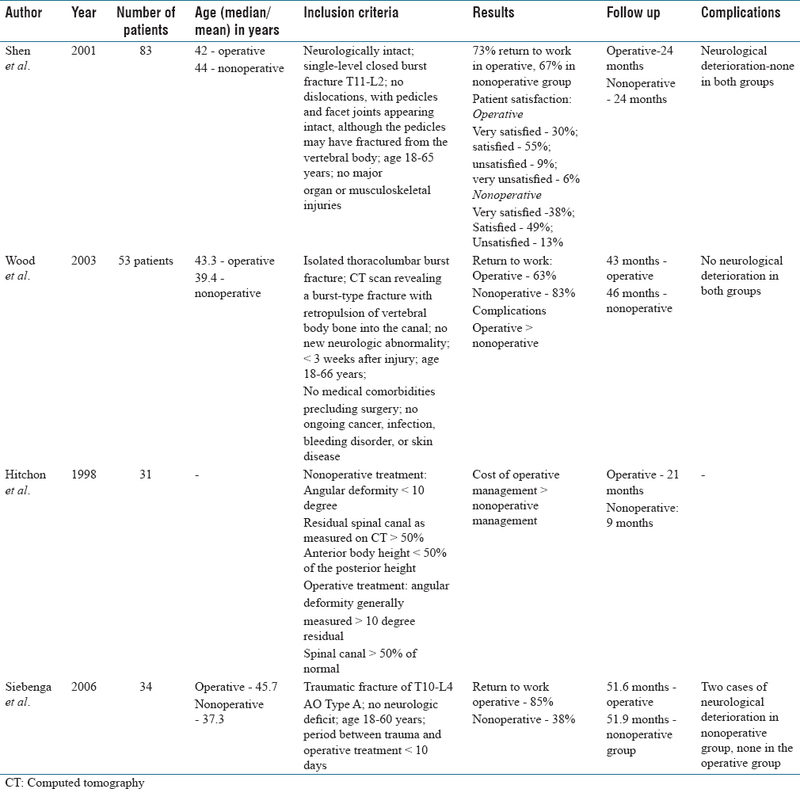 [Table 3] describes trials comparing conservative and operative management of TL burst fractures. Hitchon et al. conducted a clinical trial comparing nonoperative versus operative treatment for TL burst fractures and concluded that “recumbency is favored in patients who are intact, with angular deformity <20°, a residual spinal canal >50% of normal, and an anterior body height exceeding 50% of the posterior height. Surgical intervention is generally indicated in patients with partial neurological deficits and those with severe instability.” They have shown that neurological recovery is similar in operative and nonoperative treatment. In a randomized clinical trial, Shen and Shen compared conservative and operative management for burst fractures of the TL junction with intact neurology and reported that surgery is indicated in cases of instability and partial neurodeficits. Similarly, in a prospective randomized study with a long follow-up of 16–22 years, Wood et al. found that surgical treatment of stable burst fractures without neurologic compromise was not superior to nonoperative treatment in the long term. They concluded that patients treated nonoperatively may well be more functional and have fewer pain symptoms at a period of up to 22 years. The frequency of adjacent-segment degeneration evidenced radiographically was comparable between the two groups over time. They found that bone bridged anteriorly along the adjacent vertebrae in conservatively treated fractures, resulting in a more rigid segment, similar to those treated surgically. This may put additional strain on adjacent segments, hastening their degeneration. In contrast, Siebenga et al. in his prospective trial found significantly less kyphotic deformity during follow-up in the surgically managed group. Better results in the operated patients were noted regarding visual analog scale (VAS) pain, VAS spine score, and Roland Morris Disability Questionnaire-24 scores. The surgical group also had a higher percentage of patients resuming their careers. No correlation was demonstrated between radiologic findings and functional results in both groups. Based on this study, they advocated operative spinal deformity reduction and a short-segment posterior stabilization for patients with AO Type A3 spine fractures (burst fracture) without neurologic deficit. They could not draw firm conclusions regarding operative or nonoperative treatment of AO Type A1 and A2 fractures since the numbers were too small. Siebenga et al. attempted to give an explanation for the poor correlation between radiologic findings and functional outcome. Indirect tensioning of the anterior and posterior longitudinal ligaments with a segmental transpedicular construct and stabilization of the damaged spinal segments may protect for pain arising from interfragmentary micro movement especially in flexion and lateral bending. Another reason may be a subjective feeling of security as the patients acknowledge that “all has been done” to protect their spine from neurologic damage. This secure feeling may make them more compliant with the early rehabilitation physiotherapy schemes. Yi et al. in his systematic review of conservative versus operative treatment for TL fractures with intact neurology, did not find a statistically significant difference between their outcomes. Other reviews of the literature, have also failed to prove the superiority of one method over the other. Gnanenthiran et al. in his meta-analysis on TL burst fractures with intact neurology concluded that operative treatment may improve residual kyphosis, but did not improve pain or function in the follow-up and was associated with higher complication rates and costs. Abudou et al. performed a Cochrane review in 2013, which included the same two trials, with a total of 79 participants on which Gnanethiran et al. had published a meta-analysis in the year before. They summarized that the current available evidence is contradictory and insufficient to draw conclusions. However, they acknowledged that surgery was associated with more early complications and the need for subsequent surgery, as well as with greater initial healthcare costs. Bellabarba et al. in his study stated that since surgery is done to restore spinal stability and to preserve neurological function, surgical decompression and stabilization are generally indicated in patients with neurologic deficit, particularly in those with incomplete spinal cord syndromes, such as conus medullaris syndrome and cauda equina syndrome. In 2014, Ghobrial and Jallo published a review on the adverse events in the operative and nonoperative management of TL burst fractures. They found significant differences in the incidence of infection. The complication rate was higher in the surgically managed group though the values did not reach statistical significance. They concluded that whereas a neurologically intact patient with a stable TL burst fracture does not benefit from surgical treatment, operative treatment is indicated in patients with instability or an incomplete neurologic deficit. Even patients with complete paraplegia can benefit from surgery, as it enhances rehabilitation. No high-level studies have documented a difference in the outcome of conservative management techniques. The technique can be based on patients preference and accessibility to resources. Only a few Level-II studies compared different conservative techniques. [Table 4] describes the high-level evidence studies comparing different conservative techniques. They found no difference between the conservative techniques employed when treating AO Type A3 TL burst fractures. Stadhouder et al. found no difference in the use of a brace or a cast. While a brace maintains more flexibility, the body cast restricts movements in all directions Bailey et al. concluded that treating AO type 3 burst fractures using early ambulation without a brace avoids the cost and patient deconditioning associated with a brace and complications and costs associated with long-term bed rest if a TLSO or body cast is not available. These studies question the need for an external supportive device in isolated AO Type A3 fractures. Despite advances in the medical field, questions still remain unanswered regarding the “ideal” management options in a TL fracture. The question of surgical versus nonsurgical management which haunted a generation of spine surgeons is still haunting the next generation. There is a bifurcation in the surgical fraternity, with a group of surgeons being more conservative than the other. The role of surgical decompression or conservative treatment in spinal injuries is only supported by Class III and limited Class II evidence. Since we follow evidence-based medicine and there is good evidence to support the various management options, it becomes more of a combined surgeons’ and patients’ choice to decide the management in a majority of TL fractures. Surgery for stable TL fractures can thus only be considered as an option. This may be for want of a well-designed prospective randomized controlled clinical study which needs to be done. We know that there are inherent problems in doing such a study. There seems to be a consensus regarding surgical management in biomechanically unstable fractures such as flexion distraction injuries, unstable burst fractures, and fracture dislocations. However, the criteria for instability in a TL burst fracture are yet to be standardized. Many classification systems proposed are not able to bring in consensus among the spine surgeons. It is generally accepted that patients with progressive neurological deterioration are an indication for surgery. In patients with polytrauma, preexisting conditions that predispose to added morbidity from prolonged recumbence or with impaired compliance by mental disorders, by age or by drug addiction, conservative management is more difficult and hence surgical management is recommended. In patients with posterior column involvement, significant canal encroachment (>35% at T11–T12, 45% at L1, 55% at L2), significant kyphosis (>25°) or >50% anterior vertebral body compression, a surgical option may have better results. Patients with incomplete injuries may also benefit with surgery if there is significant canal encroachment. Both parasurgical procedures and inadequate conservative management carry potential risks to neurology. Centers providing spinal injury management should be capable and able to offer conservative and surgical management with adequately trained staff. The approach to management of a patient with TL burst fracture should not be a knee-jerk decision. All TL burst fractures are not alike and therefore should not be treated the same way. In all cases, patients should be given an informed choice between conservative and surgical management with full information about potential outcome, limitation of the type of treatment and potential complications. Clinical experience and patient involvement may help in better management of a TL fracture than evidence in literature alone. Dai LY. Principles of management of thoracolumbar fractures. Orthop Surg 2012;4:67-70. Rajasekaran S. Thoracolumbar burst fractures without neurological deficit: The role for conservative treatment. Eur Spine J 2010;19 Suppl 1:S40-7. Audigé L, Bhandari M, Hanson B, Kellam J. A concept for the validation of fracture classifications. J Orthop Trauma 2005;19:401-6. Shimer AL, Su BW. Operative versus nonoperative treatment of thoracolumbar burst fractures. Semin Spine Surg 2010;22:38-43. McAfee PC, Yuan HA, Fredrickson BE, Lubicky JP. The value of computed tomography in thoracolumbar fractures. An analysis of one hundred consecutive cases and a new classification. J Bone Joint Surg Am 1983;65:461-73. Aebi M. Classification of thoracolumbar fractures and dislocations. Eur Spine J 2010;19 Suppl 1:S2-7. McCormack T, Karaikovic E, Gaines RW. The load sharing classification of spine fractures. Spine (Phila Pa 1976) 1994;19:1741-4. Lee JY, Vaccaro AR, Lim MR, Oner FC, Hulbert RJ, Hedlund R, et al. Thoracolumbar injury classification and severity score: A new paradigm for the treatment of thoracolumbar spine trauma. J Orthop Sci 2005;10:671-5. Shen WJ, Liu TJ, Shen YS. Nonoperative treatment versus posterior fixation for thoracolumbar junction burst fractures without neurologic deficit. Spine (Phila Pa 1976) 2001;26:1038-45. Weinstein JN, Collalto P, Lehmann TR. Thoracolumbar “burst” fractures treated conservatively: A long-term follow-up. Spine (Phila Pa 1976) 1988;13:33-8. Chow GH, Nelson BJ, Gebhard JS, Brugman JL, Brown CW, Donaldson DH, et al. Functional outcome of thoracolumbar burst fractures managed with hyperextension casting or bracing and early mobilization. Spine (Phila Pa 1976) 1996;21:2170-5. Shen WJ, Shen YS. Nonsurgical treatment of three-column thoracolumbar junction burst fractures without neurologic deficit. Spine (Phila Pa 1976) 1999;24:412-5. Celebi L, Muratli HH, Doǧan O, Yaǧmurlu MF, Aktekin CN, Biçimoǧlu A, et al. The efficacy of non-operative treatment of burst fractures of the thoracolumbar vertebrae. Acta Orthop Traumatol Turc 2004;38:16-22. Benson DR, Burkus JK, Montesano PX, Sutherland TB, McLain RF. Unstable thoracolumbar and lumbar burst fractures treated with the AO fixateur interne. J Spinal Disord 1992;5:335-43. Kramer DL, Rodgers WB, Mansfield FL. Transpedicular instrumentation and short-segment fusion of thoracolumbar fractures: A prospective study using a single instrumentation system. J Orthop Trauma 1995;9:499-506. McNamara MJ, Stephens GC, Spengler DM. Transpedicular short-segment fusions for treatment of lumbar burst fractures. J Spinal Disord 1992;5:183-7. Hazel WA Jr., Jones RA, Morrey BF, Stauffer RN. Vertebral fractures without neurological deficit. A long-term follow-up study. J Bone Joint Surg Am 1988;70:1319-21.
de Klerk LW, Fontijne WP, Stijnen T, Braakman R, Tanghe HL, van Linge B, et al. Spontaneous remodeling of the spinal canal after conservative management of thoracolumbar burst fractures. Spine (Phila Pa 1976) 1998;23:1057-60. Yazici M, Atilla B, Tepe S, Calisir A. Spinal canal remodeling in burst fractures of the thoracolumbar spine: a computerized tomographic comparison between operative and nonoperative treatment. J Spinal Disord 1996;9:409-13. Dai LY. Remodeling of the spinal canal after thoracolumbar burst fractures. Clin Orthop Relat Res 2001;382:119-23. Mohanty SP, Venkatram N. Does neurological recovery in thoracolumbar and lumbar burst fractures depend on the extent of canal compromise? Spinal Cord 2002;40:295-9. Hitchon PW, Torner JC, Haddad SF, Follett KA. Management options in thoracolumbar burst fractures. The contents of this manuscript were presented as part of the 12th Annual meeting of the joint section on disorders of the spine and peripheral nerves, February 28–March 2, 1996, in Orlando, Florida. Surg Neurol 1998;49:619-27. Yi L, Jingping B, Gele J, Baoleri X, Taixiang W. Operative versus non-operative treatment for thoracolumbar burst fractures without neurological deficit. Cochrane Database Syst Rev 2006;CD005079. Thomas KC, Bailey CS, Dvorak MF, Kwon B, Fisher C. Comparison of operative and nonoperative treatment for thoracolumbar burst fractures in patients without neurological deficit: A systematic review. J Neurosurg Spine 2006;4:351-8. Abudou M, Chen X, Kong X, Wu T. Surgical versus non-surgical treatment for thoracolumbar burst fractures without neurological deficit. Cochrane Database Syst Rev 2013;CD005079. Bellabarba C, Fisher C, Chapman JR, Dettori JR, Norvell DC. Does early fracture fixation of thoracolumbar spine fractures decrease morbidity or mortality? Spine (Phila Pa 1976) 2010;35:S138-45. Ghobrial GM, Jallo J. Thoracolumbar spine trauma: Review of the evidence. J Neurosurg Sci 2013;57:115-22. Rometsch E, Spruit M, Härtl R, McGuire RA, Gallo-Kopf BS, Kalampoki V, et al. Does operative or nonoperative treatment achieve better results in A3 and A4 spinal fractures without neurological deficit? Systematic literature review with meta-analysis. Global Spine J 2017;7:350-72. Bedbrook GM. Treatment of thoracolumbar dislocation and fractures with paraplegia. Clin Orthop Relat Res 1975;27-43. Wood K, Buttermann G, Mehbod A, Garvey T, Jhanjee R, Sechriest V, et al. Operative compared with nonoperative treatment of a thoracolumbar burst fracture without neurological deficit. A prospective, randomized study. J Bone Joint Surg Am 2003;85-A: 773-81. Patwardhan AG, Li SP, Gavin T, Lorenz M, Meade KP, Zindrick M, et al. Orthotic stabilization of thoracolumbar injuries. A biomechanical analysis of the Jewett hyperextension orthosis. Spine (Phila Pa 1976) 1990;15:654-61. Bailey CS, Urquhart JC, Dvorak MF, Nadeau M, Boyd MC, Thomas KC, et al. Orthosis versus no orthosis for the treatment of thoracolumbar burst fractures without neurologic injury: A multicenter prospective randomized equivalence trial. Spine J 2014;14:2557-64.